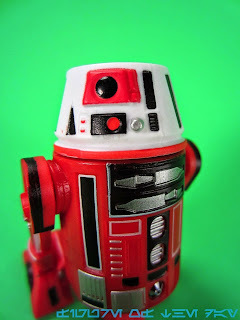 Commentary: My favorite shape of the new, post-movie domes is the R6-Series Astromech Droid and this is a colorful new one. I'm not sure that the red body is the best possible match for him that could ever be, but as far as the second wave goes there's really no more appropriate fit than this one, so let's go with it. The dome is the same mold as last year's round, except now the panels are slightly different - now you've got a mix of red and black markings rather than purple or yellow. If you don't have an R6 mold, this is as good as any thanks to its unique blending of the trapezoidal cake that is an R5 dome with some of the "facial" details of R2-D2. This makes it cuter, with a big eye and the little "face" bits but with some tweaking and new colors. 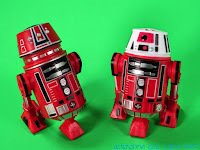 As a new droid, it doesn't have a lot of weight behind it and its appeal to you will largely come from if you think it looks cool. I do. The body of this configuration was retooled from previous astromech torso pieces. The lower holes on the R2 body were removed, so you can't make a four-armed droid anymore. 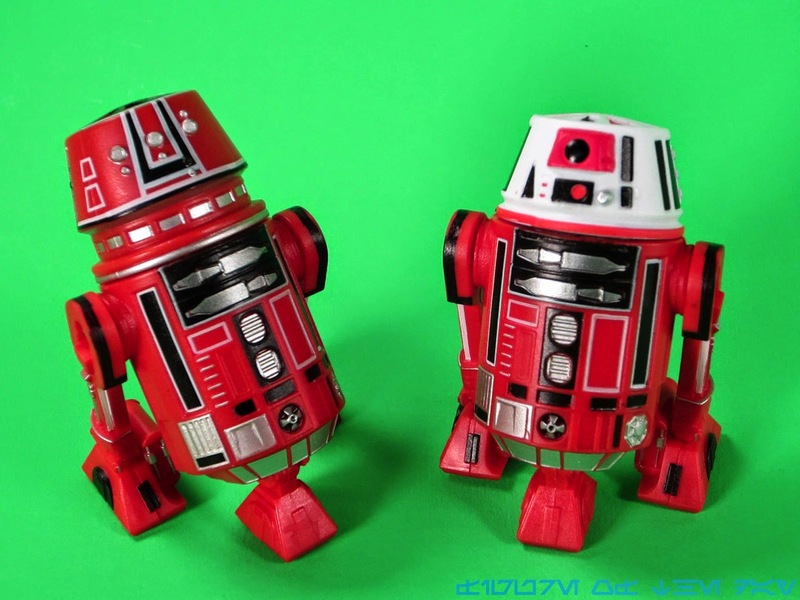 The body color is very similar (if not identical) to R5-K6, who is in a box somewhere. The black and white boxes are pretty much the same, although a small detail on the back and bottom of the droid is now absent. (No huge loss.) There are a few minor changes given the time difference and the mold, but they did a fine job of trying to replicate that hard-to-find design in this format. Like the other legs, the new "universal leg" returns here without the wires to make it obvious where the front or the back is. Black "toe" panels on the front give it a little personality, but it still lacks the dots and rods on the upper part of the limb and features retooled copyright information to excise any indication of these being Hasbro products. As such, I say it's debatable if these are Hasbro, Hasbro-compatible, or what. The white "band" above the ankle is now silver, so it's a little more subtle than before and of course the wires are now absent. The central red foot for this (and all the other) colors is now unpainted, while the R5-K6 figure had some black markings on the foot. Unless you read or write columns like this one, I assume you wouldn't notice or care. Since we know R6 droids will appear in The Force Awakens - but which ones, we are less clear - this figure might be worth getting as a tangent for that series. 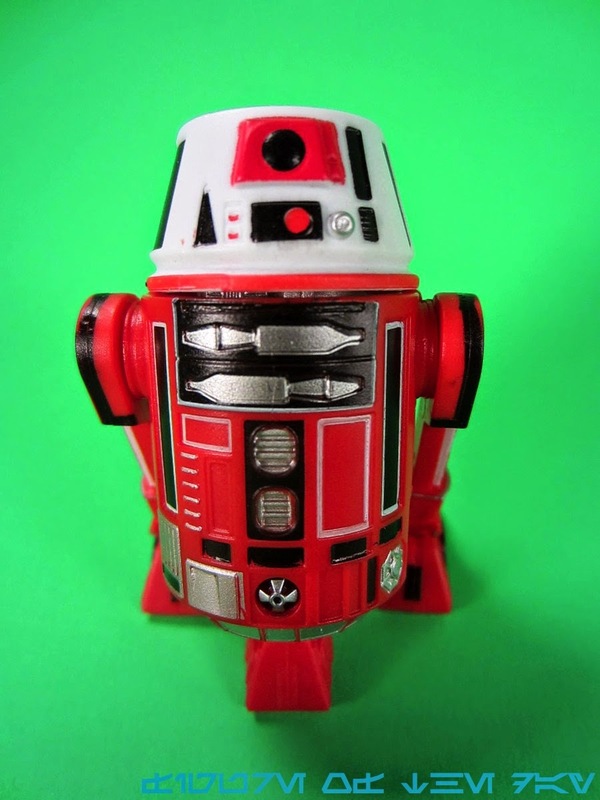 We don't know which droids (if any) will get figures before Hasbro focuses on the next next movie, so getting an R6 droid of any flavor is, at worst, an off-camera purchase. 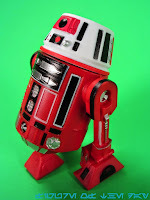 I love droids so I'll buy them all, and this one is a perfectly decent sum of its parts - but if you have any from the last round, this is hardly essential. Collector's Notes: I got this from my pal Shannon who was cool enough to get me a set from Disneyland. 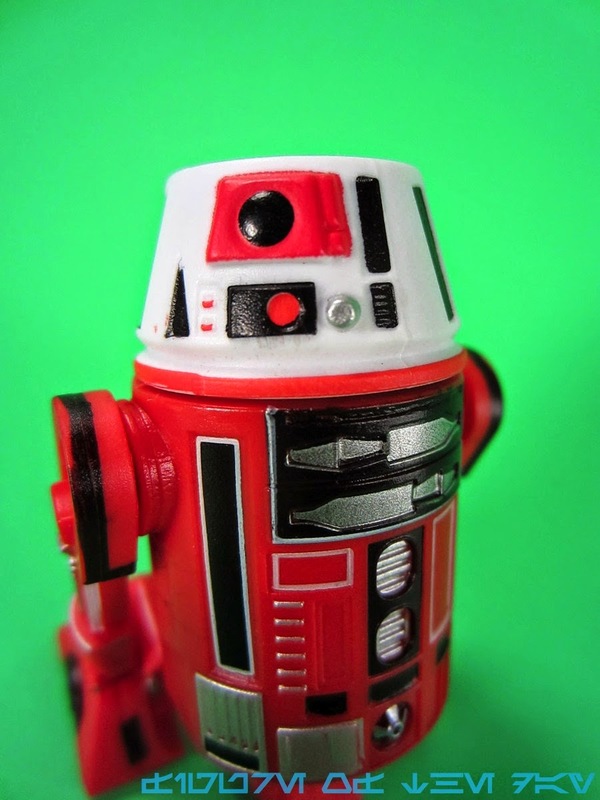 This is the only R6 droid in the first 2015 assortment.